The squirrels are furiously racing around gathering nuts and burying them while the rooks are impatiently waiting behind them to steal them. Witnessed one rook so impatient it bit the squirrels tail to get it to move on a bit quicker. There's something remarkable about these little guys. I have about 25 of them that live in my backyard and my cat adores watching them - especially at this time of year when they are scrambling! Winter is coming and they know it. Not a great fan of these greys. But given that there are so few reds left, I guess maybe they are not so bad. Nice picture. Rooks are important, too! Cute squirrel capture! I often wonder what the ratio is;eat one, bury five? Great photo of this cute little guy! he is so cute , well done ! I love how this squirrel is hanging on to the fence! Great shot! I love squirrels, check out my blog, you'll see. Your site has lovely photo's too. Incredible shot! I love squirrels, they are so cute. Congrats, Mo! Good shot. I see the same thing at my veranda most days. The birds and the squirrels fighting it out for the food! 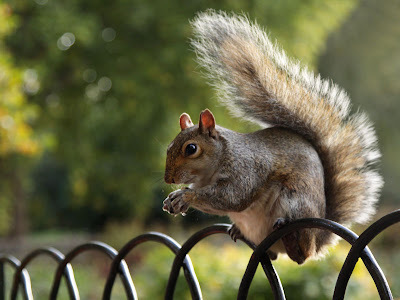 I like this shot, there are loads of squirrels all over London's parks. where was this one taken? This is a great photo Mo. So cute. Ah, another photo which could've been taken in Boston Common... except our squirrels are twice as fat! So cute but oh so mean those squirrels. Cute! I immediately thought of squirrels on US campus grounds... we don't have these large squirrels here, only small red ones and they stick to the woods or larger parks and stay away from people. Too cute!! I love squirrels!